new : WebP animation creation speed is 2x times faster than before. new : You can define a custom suffix for output files in Environment window. The suffix is added to the end of each file name, just before the final extension. changed : This one is related to Animation parameters form opened in Options window. 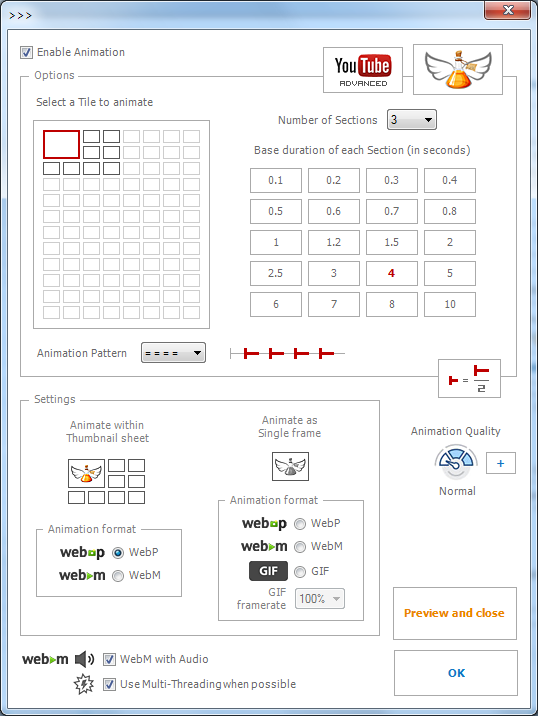 Click on the top right button shows the comparison table between WebM and WebP types of animation. new : WebP animation playback is improved. new : Support for new Pictures Thumbnails Maker "MultiFiles" feature is added. new : VTX feature support for KMPlayer 64-bit is added. new : The Folder browser has been improved. The Address bar, which is located at the top of the Folder browser, displays the path of the currently selected folder. You can paste your path to go to a different folder. new : You can use CTRL+Left Mouse Button click to select multiple folders in the Folder browser. changed : VTM does not overwrite existing animated screenlists by a temporary animation file anymore. VTM saves only ready to use animated screenlists. That prevents the existing file of being overwritten in case of job cancellation. changed : Audio/Video information module is updated. new : "Advanced Timeline Control" panel in Options. It contains "Advanced Timeline Control" button when rules are not set. It contains rule indicators with values when rules are set. new : You can Randomize actual positions at the rate of selected percent of the current time step. new : You can Cut first X% or X seconds of the video. new : You can Cut last X% or X seconds of the video. new : You can Capture the first frame at the very start. new : You can Capture the last frame at the very end. 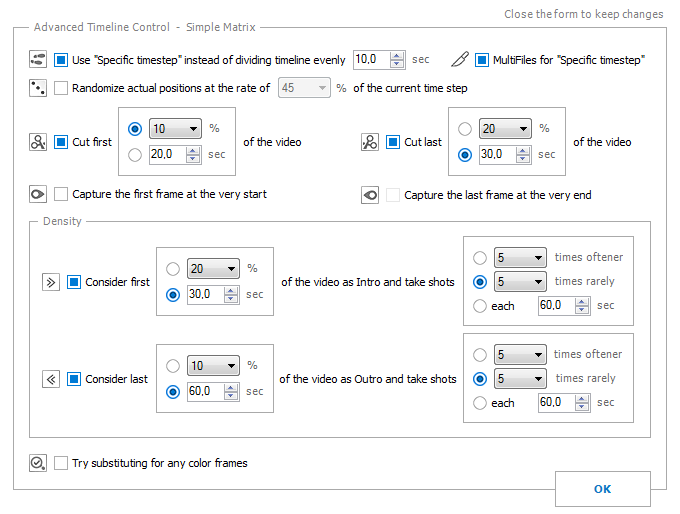 new : You can Consider first X% or X seconds of the video as Intro and take shots rarely or oftener. new : You can Consider last X% or X seconds of the video as Outro and take shots rarely or oftener. new : You can specify fractional parts of seconds in "Advanced Timeline Control" window. new : Please read popup hints (tooltips) over controls on the new panel and in "Advanced Timeline Control" window to get more info. changed : "Specific timestep" checkbox was moved to "Advanced Timeline Control" window. changed : "Try substituting for any color frames" checkbox was moved to "Advanced Timeline Control" window. An indicator is added to "Other Effects" section of Options window. changed : "MultiFiles for Specific timestep" checkbox is duplicated in Environment and "Advanced Timeline Control" windows. changed : Codec-independent engines (Ultimate and Crystal) produce shots in original color matricies. fixed : Minor bugs are fixed. fixed : "Choose shots manually" interface failed to process AVI files and MPEG4 format. fixed : Ultimate engine captured wrong shots for time steps less than 3-4 seconds. new : Codec-independent "Choose shots manually" interface. You can go through keyframes or go frame by frame on the fly. New interface is fast and free for all users (nevertheless, an owl logo is still present for non-activated users). Just select a videofile in the main list and press Hotkey 1 to open the interface, or select "Choose shots manually" in the right mouse button context menu. Please check tooltips for more info. new : Maximum number of animation sections is increased from 12 to 100.
new : You can turn ON/OFF captions by using "Captions in [English]" option in "Technical details" section. On the other hand, you can select a language of captions when the option is ON. Possible values are: English, German, Russian, French, Turkish, Italian, Korean, Japanese and Chinese. new : Animation creation speed is increased a bit. 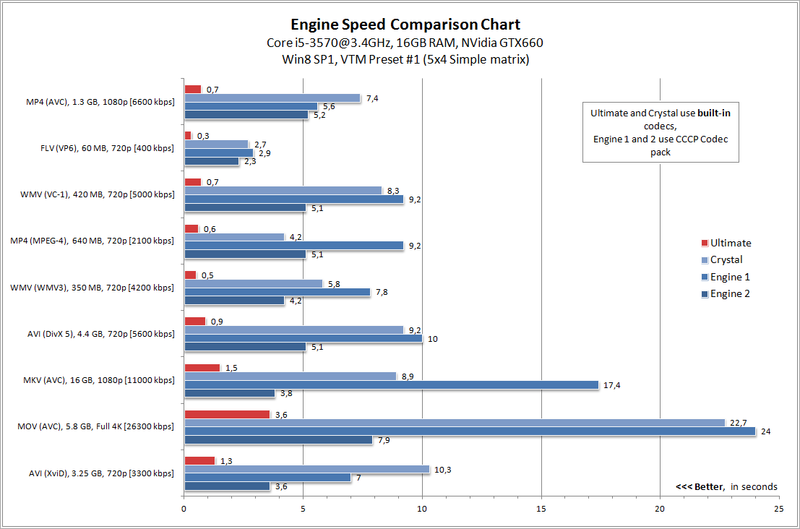 new : Experimental "watchdog" for Ultimate engine is implemented. It should not allow the program to freeze while processing video files with defects. Please provide feedback on the function. 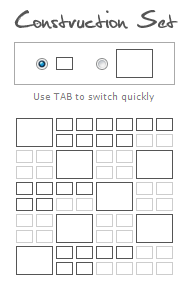 new : New visual style for checkboxes and radiobuttons. It has become easier to understand relations between controls. changed : Old "Choose shots manually interface" is moved to the second position in the mouse context menu (Hotkey 2). changed : Few cosmetic changes. fixed : Wrong timestamps for Ultimate Engine. changed : "Use the default video player for that type of video" option is improved. new : You can also add URLs via "Import list of files to process" button in the upper right corner of the main window. The default output folder for URLs is the "Internet" folder in the VTM's installation directory. You can redirect the output to your own folder as usual. fixed : WebM audio was not synced with video for larger files. new : VTX support for remote video files (HTTP URLs). fixed : Creation of WebM files with Audio longer than 3 seconds freezed the program in many cases. changed : Multi-Threading support for animations is extended for wider variety of computers. fixed : Creation of WebM with Audio freezed the program in many cases. new : You can create WebM animations with sound. new : You can select between Single frame animations and Animations within a Thumbnail sheet. new : You can create continuous Single frame animations in GIF format (like previously in WebM or WebP). new : You can reduce filesize of GIF animations and set 100%, 50% or 33% of the original framerate. changed : Old GIF slideshows are created with "_slideshow.gif" suffix at the end of filename to distinguish from new continuous GIF animations. changed : Animation settings window is redesigned. new : Using this version of VTM you can create animated screenlists right in Videonizer 4.
fixed : WebP animations with diacritic symbols in path were created incorrectly. fixed : Video framerate was parsed incorrectly in very rare cases. new : Support for WebP with non alpha transparency is added. fixed : WebP animations with diacritic symbols in path were opened incorrectly. new : The Viewer tries to guess video location in "Locate video" dialog. fixed : Jerky WebM playback in few previous releases of the Viewer. fixed : You can specify a drive letter (C:, D:, E: and so on) as a valid command line argument. fixed : Previous release of the viewer contained several bugs in its new feature. new : Finally, I managed to get Ultimate engine working as it was supposed to be in VTM 10.0.0.0. Rare Ultimate engine failures are fixed as well as "Choose shots manually" flickering without opening a file. new : "/nc" option is added to command line interface (close console automatically after completion). new : "/hidden" option is added to command line interface (create picture files with hidden attribute). changed : From now on tile area in "Choose shots manually" interface is fixed with a vertical scrollbar. changed : Comment field can be printed to text output files (CSV, XML, TXT). changed : Watermark position for the right side of the picture is moved 1 pixel right. fixed : From now on maximum Simple Matrix size is limited to 8x12 when Animation is enabled. fixed : Wrong WebM framerate detection in some cases. fixed : "Choose shots manually" interface lost the first custom chosen shot for Special Matricies. new : The Viewer tries to guess video location for a broken link by the name of VTX file. changed : The Viewer tries to show next picture in the folder when you delete current picture. fixed : Two bugs related to Command Line Interface and WebM creation. new : VTM introduces advanced animation features. new : Animation creation performance is improved significantly. new : "Animation" section is added to Options window. new : You can view basic animation parameters in "Other Effects" section of Options window. new : Buttons to Import/Export list of files are added to the main window. new : Experimental: Video rotation detection is added. changed : "Core" section in Environment window is redesigned. changed : APNG animation format was removed. fixed : Small memory leak in previous versions of VTM. fixed : "Restore last window position after restart" option did not work well in some cases. 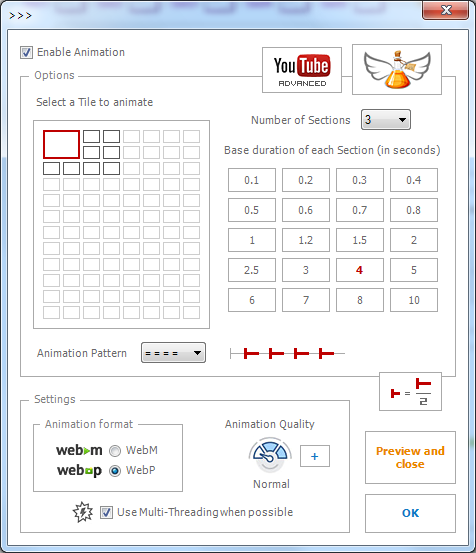 new : Playback for VTM WebM animations is added. VTX feature works for WebM as well. new : Animation framerate is taken into account. Maximum supported FPS is 60.
new : You can Copy corresponding video file to desired location right from the Viewer. new : VTX support for "MPC - BE (Black Edition)" is added. 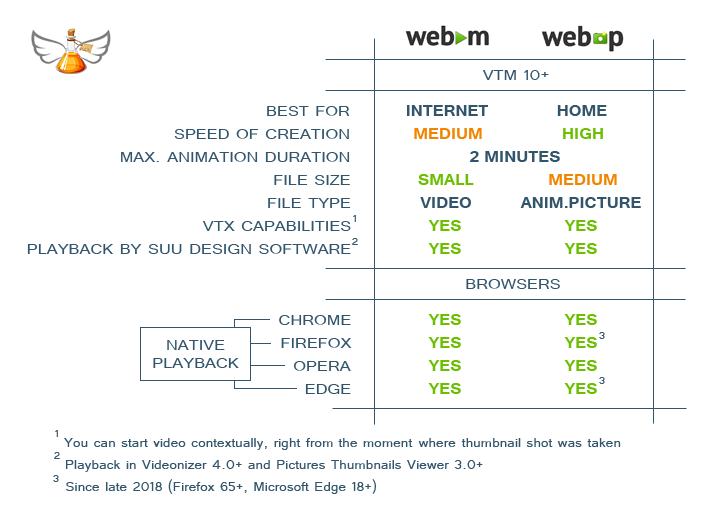 changed : Animation playback was re-engineered to consume much more less computer resources. fixed : Several rare bugs were fixed. 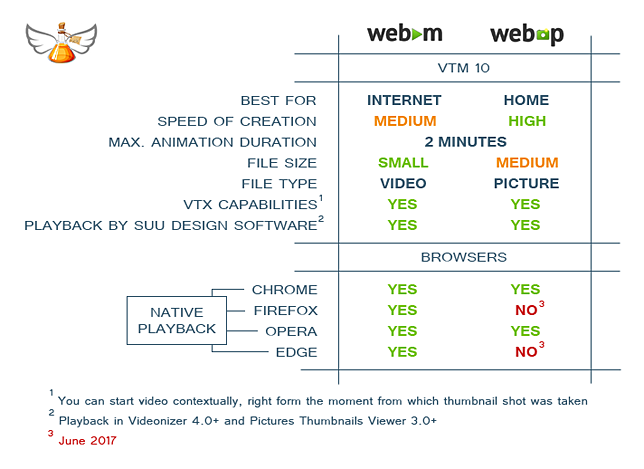 new : VTM introduces the third animation format - WebP. new : WebM/APNG/WebP selector is added to Environment window. More info in tooltip pop-up windows. fixed : Rare Ultimate engine crashes are fixed. 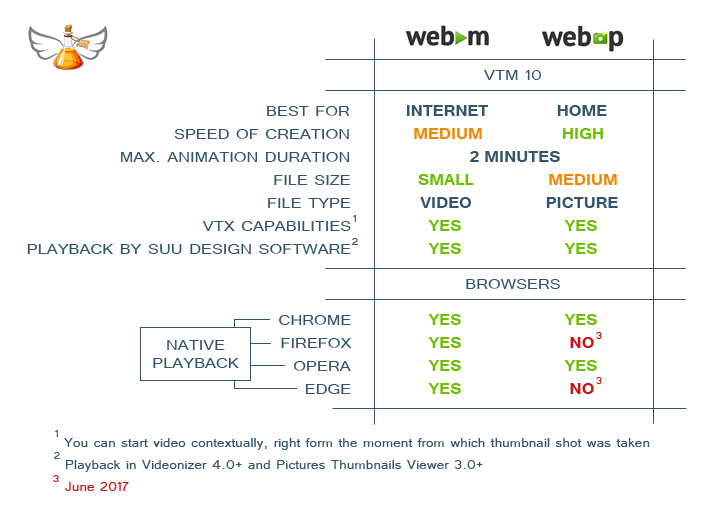 fixed : VTM did not allow to select animation duration greater than 5 seconds for WebM animation format. fixed : VTM is used by Videonizer's "Generate and add Screenslists" feature. That feature used to stop responding after proccesing certain amount of files in a batch. new : Support for WebP animations is added. new : "Associate .WEBP extension with this program" button is added to "Preferences..." window. new : "Animate Tile number" checkbox is added to "Other Effects" section in Options window. 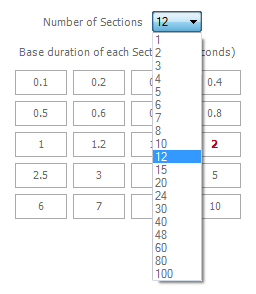 You can enter the desired number in the field below. new : "Duration" selector is added to the same section. You can set the duration of animation there. The option is available only for WebM format. Duration is set to 2 seconds for APNG format. new : WebM/APNG selector is added to Environment window. More info in tooltip pop-up windows. new : Support for WebM video extension is added. new : "Tutorials" button is added to the main window. It leads to "Tutorials" page on SUU Design site. changed : "Incremental filenames" and "Save each job into its own folder" settings are added to "Quick settings" panel on the main window. fixed : "Technical details" section was placed to wrong place under certain circumstances. new : Support for APGN animations is added. new : "Browse only VTX file" option is added to "Preferences..." window. All other types of files will be ingored. new : Viewer version is shown in "Preferences..." window. new : Ctrl+P hotkey to open "Preferences..." window. new : OGM and AVS extensions are added to "Add files with the folowing extensions" section. changed : JPG, PNG, BMP, TIFF selector is back. You can choose core format in Environment window (core format is basic both for VTX and Classic output). fixed : "Combine all files into one picture" did not work properly when "Incremental filenames" feature was set ON. new : "Close existing Video player instances before opening a new one (recommended)" is added to "Preferences..." window. new : "Delete Both - Video and Picture" option is added to right mouse button context menu (Shift+Delete hotkey). fixed : Non-alphabetical order of files in the Viewer under certain circumstances. new : Support for Windows 10 is added. changed : "Try substituting for black frames" feature is replaced by "Try substituting for any color frames" feature. That means the program will try to substitute any nearly black/white/green/yellow/... frame to another. New algorithm is more powerful and works 30% faster than the old one. fixed : VTM did not process Special matricies with only 1 row or only 1 column correctly. new : New Folder Browser dialog allows you to select multiple folders. You can also toggle "Add SubFolders recursively" feature ON and OFF right on the dialog form. "Switch to classic Browser" button allows you to select a single folder in the old-fashioned way (this also gives you networking capabilities, if necessary). new : "GB" checkbox is added to the Options window. It allows to stamp file size in Gigabytes on thumbnail sheets. new : From now on you can delete related video file right from the VTX viewer. new : Installer detects if the required .NET Framwork is installed and if it is not - it will prompt, download and install the required package. new : "Clear selected" button is added to the main window, it allows to remove selected items from the list of files ("Del" hotkey). new : Support for MXF and MPE video file extensions is added. changed : "Skip video file if ALL required pictures EXIST on the disk" feature speed is increased significantly. changed : Warning message is added to the main window. It says "To prevent crashing, it is recommended not to playback any video files during thumbnail sheets creation". changed : Hotkey to add folders is changed: Shift+Ins -> Ctrl+Ins. fixed : Crystal engine used wrong aspect ratio for certain video file formats. quickfix : Crystal Engine did not work in 6.4.0.3.
fixed : Direct click on a radiobutton in Special Matrix window did not redraw matrix appearance in Construction Set. new : "Sort timeline" button is added to "Choose shots manually" interface. changed : Vertical and horizontal scrollbars are added to "Choose shots manually" interface for small screen resolutions. fixed : Two bugs related to "Choose shots manually" interface. changed : Both "Choose shots manually" interfaces are updated to support video resolutions up to 4800x3200. fixed : Console version of the application (versions 6.4.0.0/6.4.0.1) failed, when a preset file is specified. changed : Embedded Picture Thumbnails Viewer is updated to the latest version (2.3.0.3, bugfix). fixed : "Choose output folder" button appeared to show even when "Save thumbnails to your folder" checkbox was set OFF. fixed : German translation is corrected a bit. 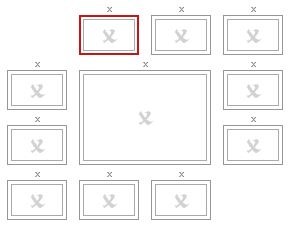 new : Build your own thumbnail sheets by using a brand new "Construction set" feature. You can arrange big/small/empty tiles in any way. new : Support for latest video codecs (HEVC/x265, ...) is added to Crystal engine. new : "Open output folder" and "Choose output folder" buttons are added to the main window and to the Environment window. new : "Format profile" information string is added to video technical details summary string. changed : From now on you can drag the main window by clicking on the owl logo. The feature is useful for small screen resolutions. new : Old fashioned file list is replaced with the modern one. It is much faster, prettier and provides more functionality. new : Now you can view up to 14 latest generated results immediately (on the fly), without waiting for entire list of files to be processed. Green triangle in front of the name of a file indicates the job is done. Click on it to view the result. new : "Sort files alphabetically" and "Sort files by File's date-time" buttons are added to the main window. new : "Please wait" animation is added to "Add folder" operation. new : Confirmation dialog is added to delete operations. 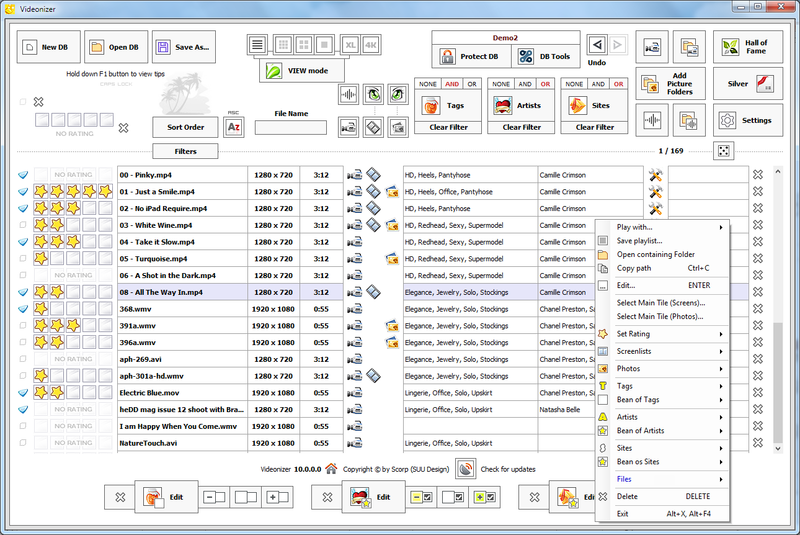 changed : "Save each sheet into its own folder" feature is reworked and is renamed to "Save each job into its own folder". changed : "Show the result" function in the main window (~ tilde hotkey) works regardless "Memory economy mode" checkbox is set ON or OFF. changed : Double click on video item to run your system's default associated video player for that type of video (middle mouse button works as well). Also you can start the video on the fly, while thumbnail sheets are generating. changed : Better support for 125% and 150% Windows scaling mode. changed : VTM does not generate duplicate TXT and XML files for each separate shot anymore. changed : MXF file format is replaced with M2TS file format. changed : CTRL+Z (Undo) feature is removed. changed : The size of the main window is increased. Many cosmetic changes. fixed : Crystal Engine could create duplicate shots under certain circumstances. fixed : Filter is added to "Add files" operation (it works for drag and drop operations as well). You can choose file types to filter in Environment window (F3 hotkey), "Add files with the following extensions" section. That setting is used everywhere in the program (while adding files, folders, drag and drop operations). fixed : General CSV and XML files were placed into wrong locations with wrong filenames under some Environment settings. fixed : Separate VTX shots did not contain proper information. fixed : "Use Crystal engine automatically if selected engine have failed" function did not work properly. fixed : VTM failed to abort the job under certain circumstances. new : It is not an easy task to find a particular scene in a video, isn't it? You can start the video from the moment from which the thumbnail shot has been taken! Once a VTX file is created, double click on it in any file manager. Picture Thumbnails Viewer will be opened. It acts like a usual picture viewer (browse pictures, zoom them, delete and so on). Right click on a Tile to get its context menu opened. There you can find the list of installed video players at your system. Click on any title to run the desired scene. new : Ending point is added to "Specific time" option. You can set "End" value in addition to "Start" value (in seconds). The program takes the minimum of two numbers - this value and the length of a video. You can disable "End" option by setting its checkbox to OFF state. "-1" value in "End, sec" field also disables the option. As well as any value less or equal to "Start, sec" value. new : You can specify "/?" or "/help" options to view current VTM command line options. new : "YouTube VTX Demo" link button is added to Environment window in front of VTX checkbox. changed : A warning message is displayed in Environment window when neither "VTX" nor "Classic" options are selected. changed : Few cosmetic changes, more popup hints. fixed : VTM failed to generate the result file for "Choose shots manually" interface under certain circumstances. fixed : Pictures Thumbnails Viewer failed to start a file under some rare circumstances. new : "Restore last window position after restart" option in Environment window. new : If a video file, pointed by VTX picture file, does not exists - Picture Thumbnails Viewer tries to load the video from the folder where VTX file is situated. fixed : Tile order in Custom matrix layouts #11, #12 and #13 is fixed. new : 30 Special matrices are added. Special matrix is a matrix where large and small frames are mixed. You can choose between Simple matrix and Special matrices in Options. new : Command Line Interface (CLI) feature is now FREE. 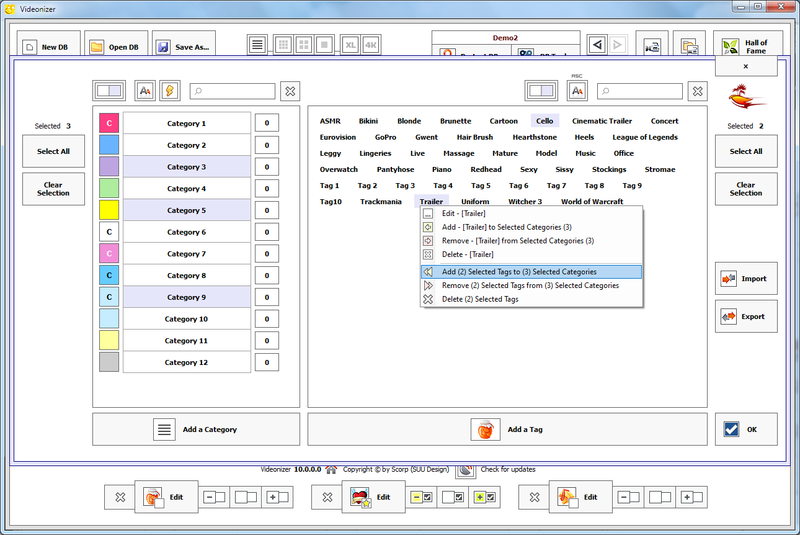 This also means you can use VTM in Videonizer program to generate sheets automatically for your items. new : Auto-setting video path for VTX picture file format is now FREE. new : Old-fashioned VTM's picture viewer has been replaced by Pictures Thumbnails Viewer (it is common for Pictures Thumbnails Maker project too). You can run the Viewer by double clicking on any VTX or PTX file in your file manager. Pictures Thumbnails Viewer supports any kind of pictures and has advanced capabilities for thumbnail sheet file formats. For VTX files this means you can click with right mouse button on any thumbnail sheet picture to open a context menu with "Start video" option in it. 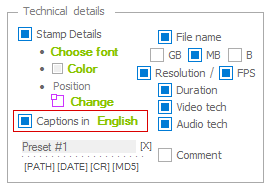 new : English hints (tooltips) are added for all languages. Tooltip is a pop-up window that displays information for an element in the interface. new : Activation window is reworked. New Bonus for newly registered Platinum members! new : Quick preview for 5 base presets is added to Options windows. Hover the mouse on a small picture next to the name of a set. You can always replace base presets with your own. new : "Save each sheet into its own folder" feature is added. The folder is named after the name of the file. new : "White Borders (available only for Special Matrix)" option is added. Possible border width varies from 1 to 15 pixels. new : Hand cursor is added to all clickable elements, F4 hotkey is added. new : F4V support is added. changed : Microsoft .NET Framework 4.0 Client Profile or Microsoft .NET Framework 4.0+ is required to run the appliaction. changed : 5 Base presets are changed. changed : The program does not allow you to add duplicates to the list of video files to process. changed : New application icon. Few cosmetic changes. changed : "Memory economy mode" option is set ON by default for newly installations. fixed : "Skip video file" function did not detect MultiFiles and GIF files properly. fixed : "Specific time" set and "Choose shots manually" combination led to an impossibility to process a file. fixed : "Stroke Tiles" effect ("Tile outlines" effect) did not work properly under certain circumstances. fixed : Long filenames were displayed incorrectly for currently processed files. fixed : "Pack" feature for "Combine all files in one picture" option did not work properly under certain circumstances. fixed : Exporting shots to disk feature did not work properly in "Choose shots manually - 2" interface. Link to FAQ is added to the top right section of the main window. Fixed a bug when VTM fails to process certain "Specific time" values. Fixed a bug when VTM fails to cancel downloading of the latest version of the program. [MD5] tag in "Comment" section now calculates MD5 hash string for entire video-file (slow for big files!). A new project is released! VIDEONIZER is an Ultimate Video Organizer designed by Scorp (SUU Design). It appears in the form of database manager with handy interface. More precise memory cleaning for completed video files. [MD5] tag is added to the "Comment" option. It allows you to add MD5 hash string to the picture (is calculated for the first kilobyte of video-file). Support for F4V files extension is added. New preset format. Old presets are not compatible with new version of application. 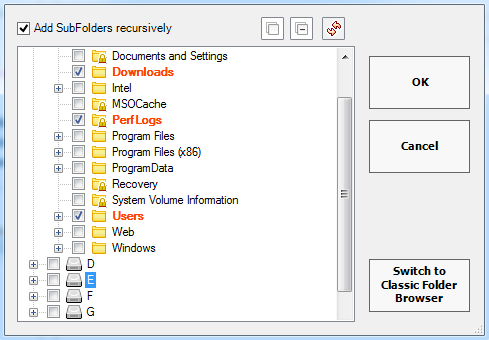 The program still uses registry to keep current options. If you are interested in keeping your old presets - you can use this feature to "transfer" your old presets to new version of the program. Technical Audio/video information module is updated significantly. New setting - "TXT". Instructs the processing engine to make a separate TXT-file with technical details, according to options selected in the Options window. New setting - "XML". Instructs the processing engine to make a separate XML-file with technical details in spite of options selected in the Options window. New setting - "General CSV-file". Allows to get one general CSV-file with technical details about all files form the list, according to options selected in the Options window. New setting - "General XML-file". Allows to get one general XML-file with technical details about all files form the list in spite of options selected in the Options window. More detailed errors logging into "Diad.log" file situated in the program's folder. Audio/video information module is updated significantly. Now you can choose - how many files to combine in composite pictures (choose "Combine all files in one picture" in the "Quick settings" section, then select how many pictures to combine in pack). Handy with serials. French interface language is added! Polish flag is replaced by French. "Multifiles" numeration now begins with 1 (not 0 as earlier). "Sorted" button is renamed to "Sort the list", it doesn't disappear any more after the pressing and sorts the list correctly. Rare bug related to the CLI folder's name passing is fixed. New generation of the program! Please welcome - BRILLIANCE EDITION! Engines 1 and 2 are improved. Annoying wmv- (and some other file types) failure is fixed. Engines 1 and 2 pictures contrast is improved till Extreme Engine level. "The product" window is remade. Draw attention on the new "Thumbnails made" and "Runs of the program" counters. List of files to process is remade. Custom presets and naming schemes icons are updated. Successfully processed file is marked with grey square on the left side. Otherwise the file is failed. If the grey square is present you can view the result right in the program. Just select the file and press ~ (Tilda) hotkey. Also you can popup the context menu by a right mouse button and select the "Show the result" item. New setting - "Memory economy mode". Turn it on if you don't need to store pictures in the memory to view results immediately after the job is done. "Moving files up and down in the list" bug is fixed (user preferences should be moved simultaneously). "Restore list after failure" function now works correctly. "No technical details" issue under Windows 2000 is fixed. 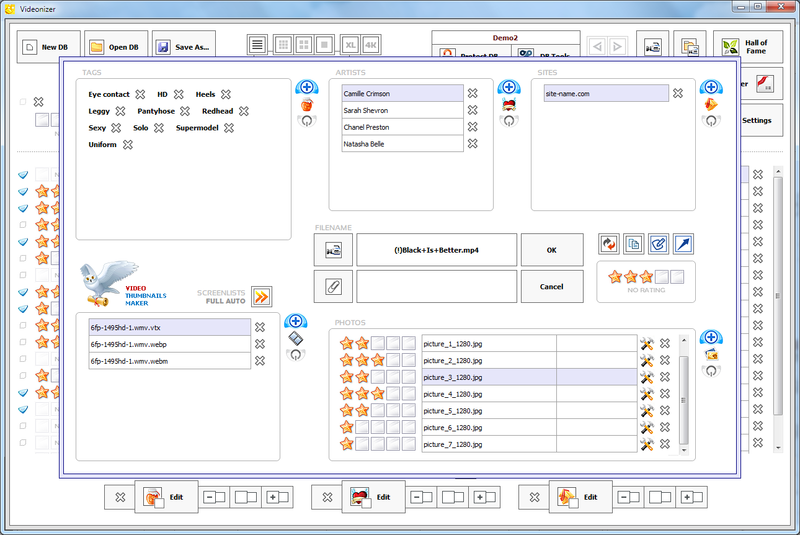 The size of the main window of the program is increased. BRILLIANCE EDITION label is added to the splash-screen. Some cosmetic changes in the "Autoupdate" window. The list of bonuses of activation of the program is updated. Now the program has Autoupdate feature! Find a new "Arrow UP" picture-button on the left side of the main window. The program will check a new version available, download it and suggest to install. USA, EU, Canada and Belarus flags are added to the language-selection section of the program. ".vtx" bug is fixed. Nothing happened after double-clicking .vtx files on some configurations. "Empty output file" bug is fixed. The bug was related to the Pixel Aspect Ratio detection on some PCs configurations. "Not marked bold" issue is fixed. It occured after disk writing failure in some cases. "Watermark" issue is fixed. It occured after the "Combine all files in one picture" setting was checked on. Timelabel in the "Choose shots manually" window now works correclty. Fixed a bug in the "Choose shots manually" window when the first frame occured to be black after the first "Auto" filling. Now "CTRL+S" (or "ALT+S") hotkey is working for the "Choose shots manually" window (submit changes). New "CTRL+Enter" hotkey in the main window - starts the thumbnails producing process. Now the program restores previously selected frames in the "Choose shots manually" window every time you enter the window. "CTRL+Z" hotkey function is updated to support new functions of the program. New "SHIFT+right/left" hotkeys in the "Choose shots manually" window - 10x step for browsing the timeline right/left (in addition to the simple 1x right/left hotkeys). New "CTRL+up/down/right/left" hotkeys in the "Choose shots manually" window - move red selection up/down/right/left in the matrix. New "CTRL+~ (Tilda)" hotkey in the "Choose shots manually" window - stores the current frame into the selected cell of the matrix. New "Ins" hotkey in the "Choose shots manually" window - imports frames form the disk. Two new buttons in the main window - the button "Up" and the button "Down". Allow to sort the list of files manually. Multiselect is supported. New "Alt+UP" and "ALT+Down" hotkeys allow to move selected files up and down in the list. Now you can multiimport shots from your harddrive in the "Choose shots manually" window. Imported shots will fill the the selected frame and the following. "Choose shots manually" malfunction from the previous version of the program is fixed. New "CTRL+Del" hotkey deletes all the files from the main window list. "Choose shots manually" window is simplified. "Stop" button was removed. "Start" and "Pause" buttons were combined into the "Start/Pause" button ("SPACE" hotkey). 0.5� speed button is added to the "Choose shots manually" window. Video autoruning is disable in the "Choose shots manually" window. Middle mouse button click on the frame in the "Choose shots manually" window goes to that frame on the timeline (in addition to the SHIFT + Left mouse button click). Rare bug in the "Choose shots manually" window is fixed. From now "empty" timecode (00:00:00) is not stamping for the imported shots. New setting - "MultiFiles for specific time step". Allows to create "MultiFiles" for the "Specific time" opiton. If "X Tiles" x "Y Tiles" matrix is not enought to store shots - a new file is creating near the first one. If the second's file matrix is not enought - the third file is creating and so on. The file number is stamping in the corner of each picture. Choose shots manually is improved. Now the program stores exactly that shot you have chosen in the "Choose shots manually" window. Now you can import your own shots in the "Choose shots manually" window. It can be any image from your harddrive. Now you can see zoomed version of the chosen shot in the left side of the "Choose shots manually" window. Just hover the cursor over the shot. CTRL+Z hotkey is improved to support the newest changes in the program. Extreme Engine now shows the original video resolution as well as the Pixel Aspect Ratio resolution if it needed.